HomeGold IRA BlogCoinsBitcoin or Bust? Bitcoin is the rage. The headlines can’t be ignored. “Bitcoin Jumps $200 in a single day!” “$1 Worth of Bitcoin in 2010 Worth $771,010 Today!” There’s no doubt that high risk takers are flocking to invest in bitcoin. But can anyone see the forest through the trees? Does anyone realize where that road leads? Certainly bitcoin promoters aren’t going to tell you. They’re saying it’s a new and improved “safe haven.” I’m here to assure you that it’s nothing more than a doorway to an Orwellian state. The hype is nothing more than misinformation and propaganda. It’s not even a fiat currency. If you can find a buyer, then you can convert it into a fiat currency. The propaganda being promoted, as well as the motivation, is no different than the fodder shoveled by Adolph Hitler to German citizens, during the 1930’s. As his military expenditures drained the country’s coffers, Germany defaulted on foreign loans and most of its trade relied upon command economy barter. Hitler blamed and made other countries responsible for the deteriorating plight of the German people (because those countries had gold and Germany didn’t). 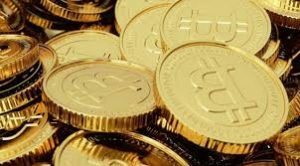 As always, physical gold is the enemy of governments and banks, because it is universal currency that doesn’t require permission from, or an intermediary, to complete a peer to peer transaction. The original staff of Microsoft all became millionaires, from the janitor to the creators, because they all were part of a company that created a high demand product that was in the right place at the right time. The company is still in place today, because it grew and adjusted with market demand. Bitcoin and its founders will not enjoy that same luxury. Whether intentional or not, they are interfering with governmental and banking oligarchs. Their success will most probably be highly lucrative, but it will be short-lived. Simply put, banks and governments are not going to give up their monopolistic franchises. Ultimately, they will co-opt, commandeer, or consume bitcoin and block chain technology. Bitcoin’s demise could take a day or a decade, but the most important points to realize are that it will happen and it won’t come with warning. And like any massive financial calamity, when most all investments drop or collapse completely, gold and other precious metals will shine their brightest. The greatest financial protection on Earth can be provided by physical gold and other precious metals. Today’s absurdly low prices are just another reason to stock up, NOW! By definition, precious metals are valuable and scarce. Protect your financial portfolio and family legacy with physical gold and silver. Freedom of choice is still a viable option. Don’t wait until the decision’s been made for you.